Laura Goularte, originally from the California central coast, is a long-time Seattle dweller and current Broadview resident who rarely leaves home without a camera. Capturing the image of a fleeting ‘wow’ moment never ceases to humble and delight her (and it can also serve as a visual complement to a mind’s eye memory). 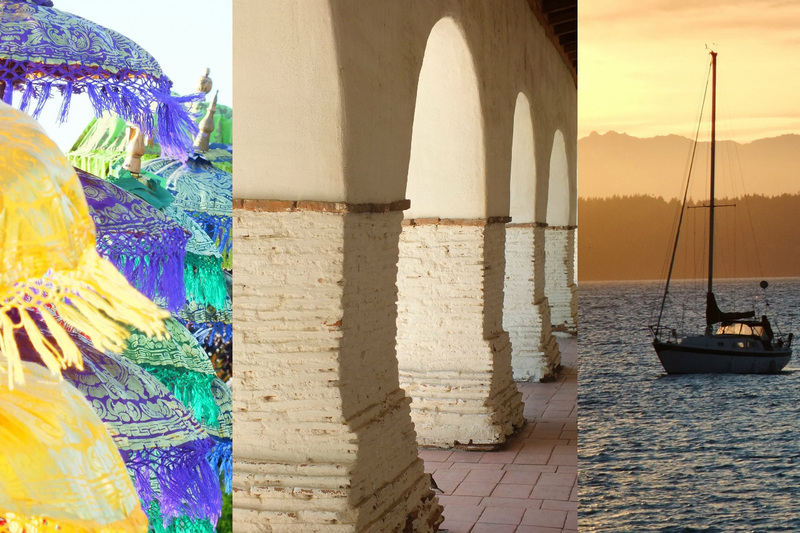 The photos in this show were taken with an android phone or long zoom camera over the last two years, at a variety of locations: mostly Northwest, some in California and a few in Argentina. Musicians playing live music include: Lesleigh Reinfried (piano), Enrique Wetzel & Rebecca Garcia (guitar), Rowan Dowell (upright bass) & Randy Dowell (piano). Artists present. Open only until 8pm. Ingrid Matthews Olson’s abstract paintings explore the interplay, tension and integration of expressive, organic forms and geometric structure. Working on both canvas and tiled paper, Olson uses color and light as building blocks to compose works that might be seen as abstracted land-scapes, water-scapes or light-scapes. For October we are hosting our 6th annual Masquerade (ahem! costume) & are proud to present ~ Fights of fantasy & imagination in “Nightmares & Dreamscapes.” Featuring the works of Brien Lautman, Cameron Lacombe, Elise Koncsek, Junkyu Lee, Katie Graham, Leela Pastala, Paisely O’Farrell, Rob A. Johnston, Amber Fowler and Kristol Jones. The opening reception Oct 11th 6-9pm featuring all original works by local artists including Photography, Painting & Living 3Dimentional Landscapes. Dress up if you dare & join us for an evening of fun & Art. Fourteen artists are lined-up for our 2013-14 exhibition year, each bringing their unique style to the table in 2 month rotations. Introductions is a sneak peek exhibition of the year to come, a delectable spread of works by Seattle urban and contemporary artists. Highlights include ornate oils by Chris Sheridan and Crystal Barbre, neon-drenched cityscapes by Greg Boudreau and Kate Protage, Kellie Talbot’s photorealism, Ryan Molenkamp’s atmospheric abstracts, Pop Portraiture by Troy Gua and more. Artists present. Illustrations by Amber Leaders. Artist present. Live Music by Carolyn Cruso –PNW Folklore Society Concert 7:30pm. Free. 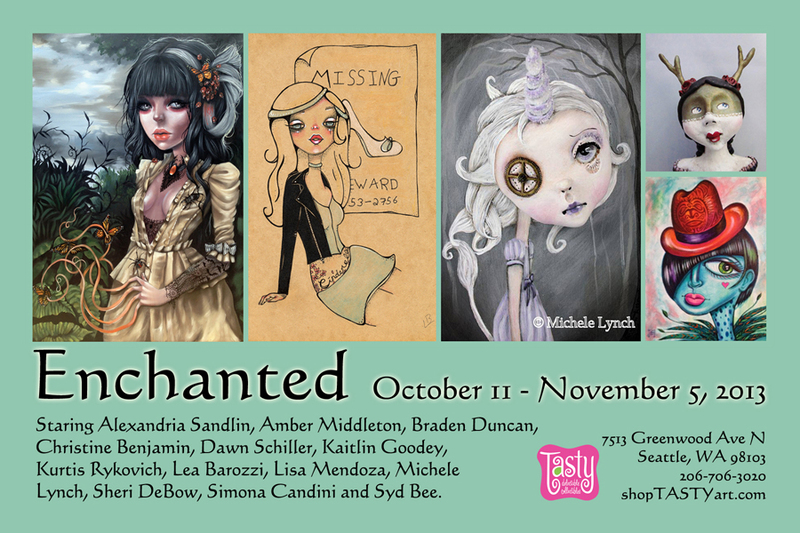 Presenting their Halloween Show “Grimoire” Featuring the supernatural works of Aliesha Larson, Eli Wolff, Jennifer Six, Alexandria Sandlin, Christoper J Olson, Maxx, Ripley and Xavier Lopez Jr. Artists present. Featuring mixed media and oil paintings by Corinna Sinclair. About the artist: My name is Corinna and I’m a Seattle and Kona Based Visual Artist and Graphic Designer. I work in a variety of media and my favorite is oil, pencil, pastels, and watercolors. I also like to experiment with modeling and photography projects. I appreciate art in all forms, style, and media. My paintings are somewhat rustic, and each original work has it’s own unique character. I lean a lot on simplicity and bold color. I see hands on art just as important as art created digitally. Exotic ports of call are captured in oil. Most of my work reflects my imagination, emotion, and my personality. Many of my earlier work shows my life growing up in Seattle and Kona, Hawaii – from tropical landscapes to Pacific Northwest moonscapes. Today I paint all kinds of subjects and I continue to grow and experiment with different mediums. Eventually I’d like to focus more on mixed media projects. I look forward to a lifetime of painting. 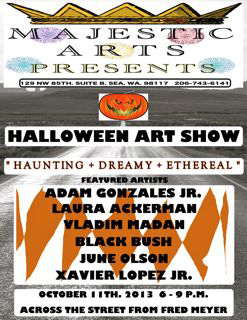 Halloween Show featuring Adam Gonzales Jr., June Olson, Laura Ackerman, Xavier Lopez Jr., Vikram Madan and Black Bush. Haunting + Eerie + Ethereal inspired visual art. Venue is located across the street from Fred Meyer. Artists present. A personal and artistic exploration of paintings done with oil bars by Carie Cook. Artist present. A spooky winter netherworld full of pumpkin-headed scarecrows and walking snowmen comes to life in these exquisite figurative paintings by Sky Gerspacher. Artist present. Comic and pinup themed artwork by Mollie McGrath. Join us to celebrate the artists selected by jurors for our Northwest Fine Arts Competition! Local jurors and art experts Jason Huff and Jonathan Wood selected a wide variety of works for this show. The winning work is The Topography of Fire, by Suze Woolf. She receives the jurors prize and a solo show in the Phinney Center Gallery in 2014. Join us to see the art and meet the artists on Friday, October 11th 7-9 pm at the Phinney Center Gallery. Featuring the following artists: Sandi Bransford, Kristen Chick, Cynthia Esselman, Karen Hackenberg, David Owen Hastings, Irena Jablonski, Deborah Kapoor, Anita H. Lehmann, Ann Maki, Paul E. McKee, Mytchell J. Mead, Sandy Nelson, Angie Prince, Cheryl A. Richey, Kristen Scott, Tracy Simpson, Elana Winsberg and Suze Woolf. Artists present. Inspired by magical worlds where characters of the mystical and mythical reside. 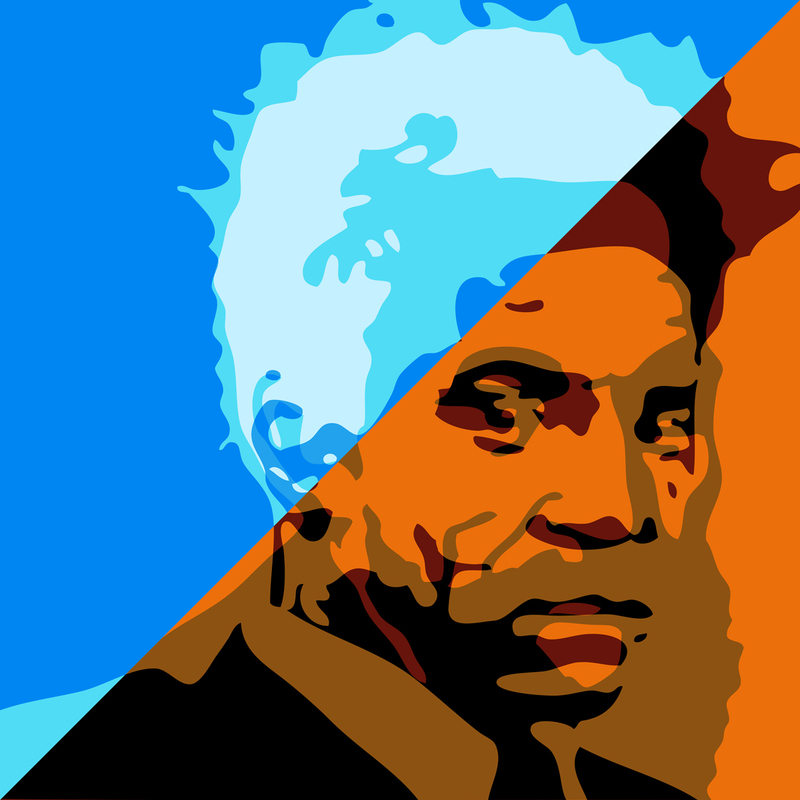 Come to Tasty in October to witness how 13 artists from across the country interpret this theme. Featuring work from Alexandria Sandlin, Amber Middleton, Braden Duncan, Christine Benjamin, Dawn Shiller, Kaitlin Goodey, Kurtis Rykovich, Lea Barozzi, Lisa Mendoza, Michele Lynch, Sheri DeBow, Simona Candini and Syd Bee. Artists present. The Works Progress October Artwalk Edition, we wanted to be sure you are getting enough GOOD chocolate before Halloween! 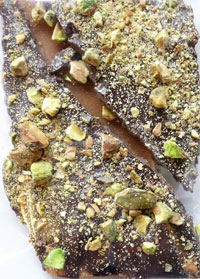 Topher Farrell of Tease Chocolates will be providing chocolate tasting and have some of the delicious Tease Chocolate specialties available for you to buy on site. This will include Tease signature items like Salty Mermaid, Geishas Pleasure, Spicy Mayan, Pistachio Butter Crunch & Ginger Lips! In addition to chocolate tasting, we will be hosting our new artist, Jeff Petterson. His artwork includes black & white portraits in black acrylic paint. Refreshments will be served. *Venues offering artwalk specials and discounts.